100th Post: So Far… So Good… So What Do You Think?? Earlier this week marked the six-month anniversary of this blog’s existence. During that time it has grown from a little repository for me to share some music-related snarky remarks and sarcastic comments, to an actual site for semi-legitimate music journalism, with news being shared and reviews being written based on requests from bands, labels, and publicists all over the world! Well now, just a few days later, I am hitting another important milestone because this is the 100th post to be published here. And, at some point earlier this week (I don’t know exactly when, but it looks like it was probably on Tuesday), I had my 5000th visitor. That might not sound like a big number, but just for the sake of comparison: in the second half of October (from the time of my first post, through the end of the month) I had fewer than 25 viewers, but in the first half of April (through today) I have had just under 1000. That sounds pretty good to me, when I consider the fact that I have done virtually zero advertising (outside of sharing my posts with the bands/labels/etc. that I’ve written about, on their Facebook pages). 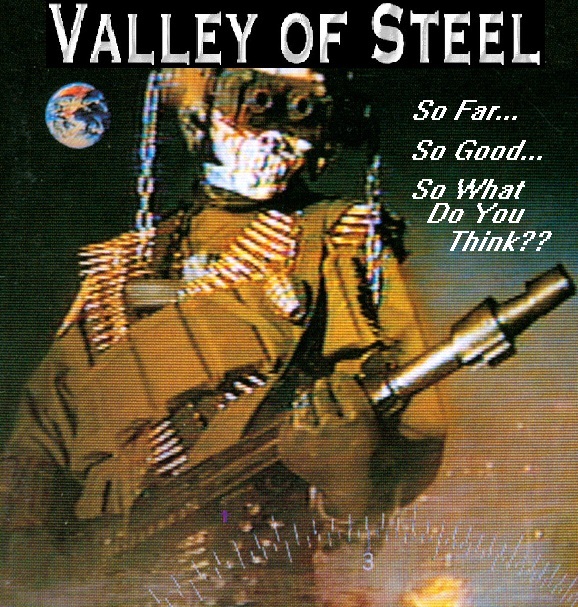 I know when I originally wrote the About the Valley of Steel (The Blog) page, I indicated that my reasons for starting to write were personal — in other words, that it was chiefly for my own benefit. That remains mostly true, because honestly, music is such a big part of my life, and I think it’s awesome that I have the opportunity to hear so much new and exciting stuff all the time. At the same time, I view writing as a way that I’m able to give something back to the musicians (and other people in various facets of the industry) to show my appreciation for what they do. If somebody reads something that I wrote, and they go on to “like” that band on Facebook, or attend a show I wrote about, or buy an album that I reviewed, well… then I feel like all the work I do here is 100% worth it. I’m really curious about the people who visit here — whether it’s the regular readers who have subscribed by email (or RSS feeds), or those who “like” the blog on Facebook, or the much larger group who randomly end up here through Google or some other search engine. I’d especially be interested to see exactly what it is people find appealing about this blog (or not! ), since like I said, if I manage to attract a wider audience, I will be better able to spread the word about all the great music that comes my way. So if you could possibly spare just a moment of your time today (or whatever day you happen to see this post), I would be immeasurably grateful! Please feel free to add a comment on this page, or if you prefer to contact me privately, there is now the option to send me a direct message on the Valley of Steel Facebook page. Either way, I would really love to hear from you! Thanks in advance. You don’t have to give your real name or anything if you don’t want to. But are you in a band, or a publicist or a manager, do you work for a record label, do you write for a different blog, or are you just a fan who loves to read about music? What city, or even just what country, do you live in? Was it a review of a specific band or album that caught your attention, or did you come here by Googling something, or maybe did somebody refer you here? What has been your favorite (or least favorite) post you’ve read? I know you haven’t read them all, and maybe you’ve only seen one or two of them. I’m just wondering whether you have an opinion, or if there was anything I’ve written here that you found memorable? What do you like (or dislike) about this blog overall? You can say anything — be honest — I’m just curious what people would like to see more (or less) of around here. Bonus question: What band(s) or album(s) have you NOT seen me write about that you think I should cover here? I’m open to pretty much anything, so feel free to suggest whatever comes to mind — especially if it’s a band you are in (or represent, or work with in some capacity)! In any case, obviously, it would be real helpful if you have a way for me to get a LEGAL copy to listen to! That’s it… unless you can think of anything else you’d like to say. Now it’s your turn… Go for it! Hey I’m Adam and I run the Facebook page and blog page Moshpittsburgh. I do it for the same reasons as you, giving back to an awesome scene any way I can. Pittsburgh keeps growing as a scene and if my work has helped in even the smallest way by spreading word about shows its been worth the hours I spend a week seeking out shows. It’s great to see a local blog dedicated to metal and you are doing an awesome job of updating it almost daily. Keep up the good work and hopefully I see you at a show soon. I don’t get out to shows nearly as often as I’d like to — seems like on average it ends up being only about once every two or three months — but I do try to stay connected to the local ‘scene’ as much as I can, and I’m glad to have this website as an outlet to help support it in my own way. So who are you? My name is BreadGod. Where are you from? Kansas. How did you get here? Found it while browsing No Clean Singing. What has been your favorite (or least favorite) post you’ve read? My favorite post would have to be the Obolus post. What do you like (or dislike) about this blog overall? I wish there were more posts. Bonus question: What band(s) or album(s) have you NOT seen me write about that you think I should cover here? Orestes! Cool, thanks for stopping by! I’m glad you liked the Obolus review — it hasn’t gotten a whole lot of traffic yet, but I think that was a great record. I have to be honest, I’m not familiar with Orestes, but I’ve just found them on Facebook and I’ll try to get in touch with them… thanks for the suggestion! Well, you know who I am and where I’m from, and I mainly wanted to say congrats for reaching that milestone. More people need to know about what you’re doing! Hey, thanks, that means a lot. I hope it didn’t sound like I was fishing for compliments or anything, but still, I appreciate it.